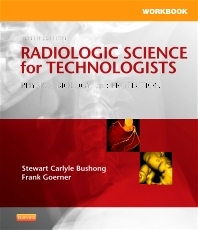 Sharpen your radiographic skills and reinforce what you've learned in Bushong's Radiologic Science for Technologists, 10th Edition. Corresponding to the chapters in the textbook, this workbook helps you learn by doing worksheets, crossword puzzles, and math exercises. A Math Tutor section helps you brush up on your math skills. You'll gain the scientific understanding and practical experience necessary to become an informed, confident radiographer. In-depth coverage lets you review and apply all of the major concepts from the text. Over 100 worksheets make it easy to review specific topics, and are numbered according to textbook chapter. Math Tutor exercises provide a great refresher for beginning students or extra practice with decimal and fractional timers, fraction/decimal conversion, solving for desired mAs, and technique adjustments. Penguin boxes summarize relevant information from the textbook, making it easier to review major concepts and do worksheet exercises. 17. Digital Radiographic Technique NEW! 30. The Digital Image Display NEW!